Where is /tmp/mount/ now for OpenWrt18? After completing oupgrade -latest I found that directory /tmp/mount/ no more present in OpenWRT18. Thus, any detailed instructions about expanding memory space, swap file and so on is not valid now on this site??? I2C: how to read a single byte without register address? Some ICs, such as PCF8574 bus expander, have not any internal registers and accessible using the device address only. So we can write or read data using device address only. If say about Python module, for writing we can use i2c.write(addr, byte) where addr is I2C slave device address. But what about reading data from device where register address is not used? How I can read single byte using Python module if device have not register address? 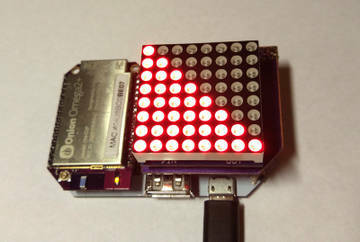 @Michael-Hebert if you mean panel like this https://www.adafruit.com/product/420 then I think you can not. This is not SPI device but "12 16-bit latches that allow you to drive the display with a 1:8 scan rate." 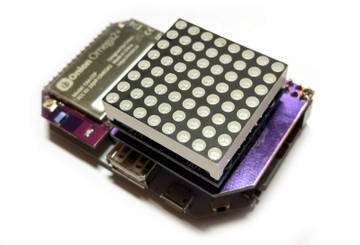 as described by Adafruit. Also, "Keep in mind that these displays are designed to be driven by FPGAs or other high speed processors: they do not have built in PWM control of any kind." "you'll need 12 digital pins, and about 800 bytes of RAM to buffer the 12-bit color image." Without own driver/controller this panel is silly device. As an idea only - try to use Arduino based board and Adafruit library as panel controller, and Omega2 as main unit and communicate them using SPI, I2C or UART. @Ken-Conrad My Omega's firmware version is 0.1.9 b149 and I never had a software problem with basic SPI functions (but I did not try to record a really long sequence of bytes - there was no need). Only hardware issue with weak CLK output was founded. Sometime it seems like unstable Omega booting process when SPI device connected, sometime unstable or impossible reading/writing to SPI device. The reasons to use M74VHC1G... in final project was: 1) very small size, possible to put it under module board; 2) small input capacitance and very fast logic; 3) very cheap and popular. For breadboard mounting and experiments I use some chips in DIP packages such as 74HC125 or 74HC244N. The letter H means "High speed" - is what we need. Also you can download the python program (file matrixtest.zip attached to project) as small sample how to to use SPI python module with MAX7219 integral led driver. For more clear understanding how it work refer to datasheet of MAX7219. Important hardware notice: Omega2 CLK line very sensitive for outside parasitic capacitance, so special "1-line bus buffer" integral circuit used for this outgoing signal. Without this smal IC your Omega2 may work very unstable - remember this issue for your future projects!